As do I, Lithp. As do I.
Ditto. He was such an awesome guy. I still think about Sandman...I miss him so much. I wish I'd gotten to know him more. I wish I just knew him at all. The way everyone is mourning him, and for how long after the fact, makes me wonder just how awesome he must have been. He was a mentor to many and he didn't ask much in return. He was one hell of a Scotsman. You should look over his posts on the old ProBoards forum (fstdt.proboards.com) which, as of the time of this post, is still around, if not active outside the occasional drive-by spambot. I think anyone that had any contact with him at all, even just reading an old post, was enough to leave a lasting impression. Would it be inaccurate and presumptuous of me to say for all of us that he was this forum's wise grandfather we all loved? Nah. I don't think so, anyway. Not at all. I think most of us looked up to him. He was a pretty cool guy. Really well educated, he was a theologian. Saw combat in Northern Ireland. 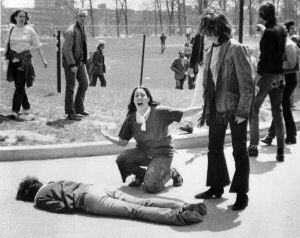 Was caught up in the Kent State shootings, he was there to visit his girlfriend. His picture is one of the most iconic of the 20th century. That's him in the fringed jacket and his face turned away. You will never find the identity of the person in that photo on line. I know his name was Allison ( it's a Scottish unisex name ) , Sandy for short. He used to write Dr. Who story lines for the BBC. For realz. Skyfire used to alternately drive him nuts or make him laugh. He kept out of most drama and never posted on the racy threads. I will still remember my misquote from potato GLaDOS in Portal 2 as my good-bye message, because that was what she said after finishing the last area of 'Ancient' Aperture Science.